What are the voltages on a ATmega32u4 (eg Arduino Leonardo) such that a HIGH or LOW is read? How do I interpret the VIL Max and VIH Min? Is the input undefined between those two values? LVTTL is Low Voltage Transistor-Transistor Logic. In general, the term "TTL" is used for a digital signal. The "Low Voltage" part is special, the ATmega32U4 switches from low to high (and vice versa) at low voltages. VILmax = 0.2 * 5 - 0.1 = 0.9 V.
VIHmin = 0.2 * 5 + 0.9 = 1.9 V.
Between those values the input signal is seen as low or high, but the exact voltage when it switches from low to high may vary. When the microcontroller is running at 5.0 V and is used within the specifications of the datasheet, then a voltage below 0.9 V is always seen as low and a voltage above 1.9 V is always seen as high (guaranteed). Those voltages is what a electronics designer must consider. In the datasheet of the ATmega32U4 at page 403 is paragraph 30.7 "Pin Threshold and Hysteresis" with figure 30-22 and 30-23. The figures show that at 25°C and 5V, the input switches from low to high typical at 1.55 V and it switched from high to low at maybe a slightly lower voltage. 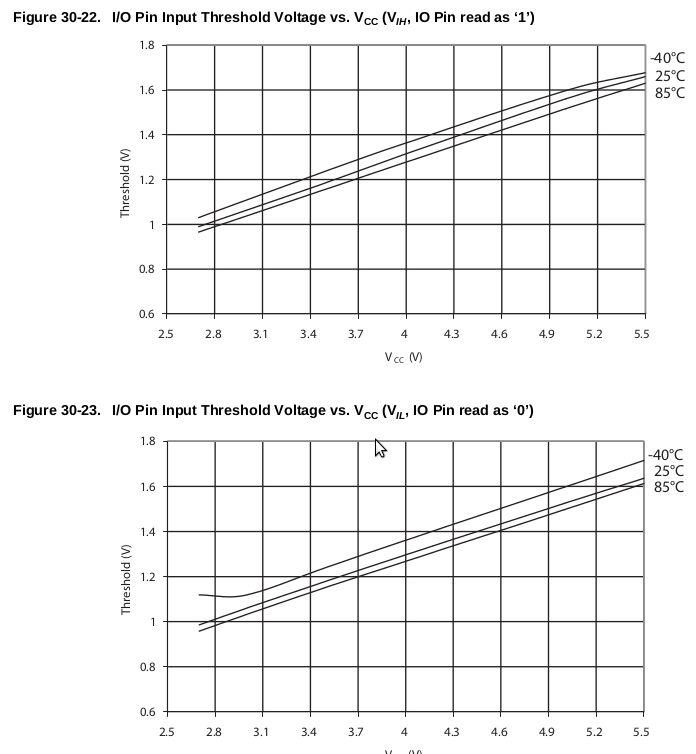 The hysteresis is almost none and the voltage depends on VCC and the temperature. Not the answer you're looking for? Browse other questions tagged voltage-level digital atmega32u4 voltage digital-in or ask your own question. Digital read on voltages between 1 and 31 volts?